In endurance mountain bike racing, anything can go wrong. Over the course of 9 hours there is plenty of time for your bike to break, for your body to revolt against you, for you to lose focus and crash, or to simply become unmotivated. To do well, you need all of those things, and more, to not happen. The Cohutta 100 is a mountain bike race in the Cohutta wilderness area that sits between the Tennessee and Georgia border. It is a 100 mile race that climbs 14,000 feet and descends just as much in its mostly out and back format. Charles Nelson does a fantastic job every year putting the race on and the volunteers are exactly what you’d expect from an NUE race: energetic, helpful and fantastic. A week before the race, one of the best mountain bike pros in the country, Jeremiah Bishop, announced he would be starting. That deepened the field significantly and promised to make the race even harder. There were over 150 open mens racers, a bunch of singlespeeders, women, and masters (50+) on the line to make a field of just about 250. The gun went off, and we began. You never want to go very hard when you’re racing all day. It’s all about being steady for hours. But at the beginning of a race like this, starting slowly can lead to getting caught in traffic at tight sections of trail. So, when the gun went off, the front few rows hit it hard. After 2 miles of fairly steady climbing on the road, the 250 person field was strung out. The lead pack was about 15 strong as we headed into the first single track. We wound and weaved all over the mountain side and the pack thinned further. Around mile 10, my Rare Disease Cycling teammate Rob Spreng led the group of 8 as we entered a series of fast tight downhill sections. I sat 7th wheel and slowly began losing contact as Rob, Jeremiah Bishop, Gordon Wadsworth, Gerry Pflug, Chris Michaels and Andy Rhodes ripped through the trails faster than I was willing to go. It is at these precise moments that you have a very important decision to make. Do you turn on the gas and burn precious energy closing the gap that has formed? Or, do you be patient, settle into your all day pace, and trust that is the smartest thing to do? It’s a hard decision to make. You’re in a race, you can see your competition just a few seconds up the trail! But closing that gap down, however small it is, will hurt you at hour 7 and beyond. So, I settled in, and waited. Fast starts are great. They set you up to move easily through all the opening miles of track. But, it also means that there are a lot of fast guys behind you, and you will get passed ALL DAY by the overly zealous. That is exactly what happened. Around mile 16 the single track ended and a few guys came by me chasing the leaders. I tried to remember the day ahead, and keep my pace steady. “Maybe I’ll catch them later” I told myself. A few miles later, Garth Prosser, snuck up on me (literally) to try to scare me. He gave me a slight push and startled me; he got me good! We talked for a minute and he relayed no one was even close behind us which was great to know. He motored on and I once again had to fight the urge to up the pace. “Patient, be patient,” I kept telling myself. In such a long race, you lean heavily on various things and are forced to trust (sometimes blindly). I had to trust that even though I hadn’t done many long rides this year, that my coach Chris (of Chris Beck Racing) had prepared me well for the race. I had to trust my nutrition strategy would fuel me well into the late hours of the race. I had to trust that my SRAM drivetrain would keep shifting well, not get jammed, or loose. I trusted that my Specialized Epic would keep me stable on the 45 mph downhills of the race. A week before the race I had flashbacks to last year when my brakes were failing towards the end, so I went to Twenty20 and they tuned them perfectly to ensure I was ready to go. All the variables spin through your head and separating from them, turning your mind off and pressing on is all you can do. I was feeling steady like I was climbing strong, but at mile 40, Roger Masse and Jesse Kelly (two of my RDC teammates) rolled up on me like I was on an easy Sunday ride. This time, I forgot patience and upped my pace to stay with them. My heart rate jumped as my power spiked as a result, and I soon realized this was not smart. So again, I backed off and watched them pedal away. More people passed. It was getting discouraging. Patience. Mile 48 brings elation and the biggest smile to your face. The climbing is done (temporarily) and it’s time to head down the mountain to the turn around. I ripped my way down the long descent and finished the single track that is the turn around. Almost immediately, the road turns back up for 7 miles of steep climbing to go back the way you came. I was promptly passed, AGAIN, by two riders. I was about 5 hours in at that point and the thoughts of holding back didn’t even cross my mind. My pace was set, there was no upping it now. Towards the top of the climb, to my confusion, I saw Greg Rittler descending toward me. He had missed a poorly marked turn and ended up doing an additional 14 miles and 2000 feet of climbing! Bummer! He flew past down the mountain and I continued on my way up. Reaching the top of the second climb is a huge weight lifted off of your shoulders. The hardest part of the day is over. My spirits lifted a bit and I began my meandering back towards the long downhill. A few riders came into view and a few riders passed. My mind had lost track of my position so I simply focused on keeping my heart rate steady, riding fast and smart. At this point in the race, the only thing left you can do is make sure your nutrition is rock solid. Any lapse you have in your intake, any hesitation in drinking and eating can take you from a good race to a horrible race. I always use Infinit for every race. It gets you the calories and the fluids all at once. Simple, no thinking required. Thankfully, it was working like it always does: flawlessly. Down the mountain I flew and after what seemed like an eternity, I was back at mile 85. Exhausted and losing focus, my previously positive mental state was deteriorating quickly. I actually prayed that I would zone out for the final miles which features many little climbs, and that’s exactly what happened. Until mile 90. I was content with my day. I had ridden consistently and hadn’t made any mistakes. I felt rough but knew the finish was within reach. Just then, Brian Toone rode up next to me. “What are you doing here?” I asked. It turns out he had missed the same turn Greg had! Such a disappointment. He seemed to be in good spirits and promptly continued on his way much faster than I.
I glanced over my shoulder and a Toyota rider was about 30 seconds back. Until this point, I was content to hold my pace and not really “race” anyone all day. But then, the competitiveness turned on, I zoned out (as requested!) and I drilled it. Out of the saddle I hammered the climbs, pushing 30% harder than I had been all day. My heart rate jumped up and I began flying. The pain faded to the background, and I was dead set on not getting passed again. Instead, I began picking up riders. One by one they appeared around turns, head down, legs heavy, slogging their way towards the finish. I passed as quickly as I could, and saw Toone again as we entered the final single track. Being primarily a road racer, he doesn't get the same training time in tight single track and was very gracious to let me come by. I was racing scared, afraid to be caught by anyone and the fear propelled me forward. Every twig snapping, every bird chirp sounded like someone’s drive train coming up on me. I pushed and pushed. The final descent came and I did it a full minute faster than I ever had before. I trusted my tires (Fast Trak/Renegade) to their complete limit, hoping no one would be able to match the pace. Toone was on my mind as I came out on the final 2 mile stretch of road the finish. He’s got a lot of power that is hampered by single track, but when he hits that road section, I knew he would be crushing it. So I put my face on the bars, tucked down as low as I could, and hammered with everything I had left. I crossed the line in 8:32 which was good enough for 7th place. I was thrilled. I had hoped for a top 10, so 7th was a nice reward for the dig I put in over the last 10 miles! 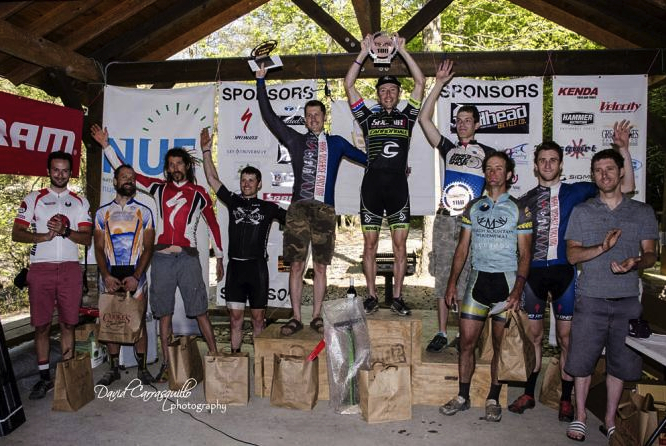 Jeremiah Bishop ended up taking the win with my teammate Rob Spreng finishing 2nd on the day. Gerry Pflug also had a great ride taking 4th in the singlespeed even after getting lost for 30 minutes. Roger Masse bagged 2nd in the masters (which was a tough field) and Jesse Kelly had a solid ride finishing inside the top 15. It was a hard day, and a battle. But, in the end, the patience paid off.